Sri Lanka, once known affectionately as "Ratna-Dweepa" or Gem Island, is a haven for some of the world's most precious stones. On a recent trip, one of our Founders, Chad Hayduk, was so mesmerized by the prismatic luster of the country's gemstones that he set out to capture their radiance stateside. The result is two shimmering shades that dazzle like their namesake stones. And, yes ladies, the stone pictured is 908 Carats in the flesh-eat your heart out! A rich burnished gold with gleams of warm bronze and copper. Use wet or dry over the lower lid and wet along the lash line. Top with Aurora or Jupiter Creme Eye Definer for definition along the lash line. 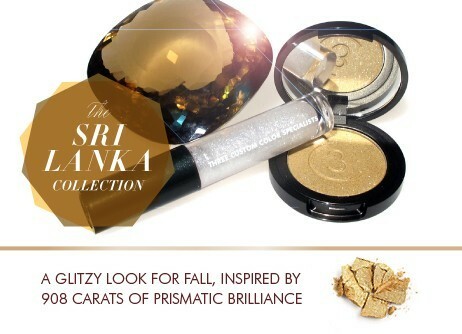 A highly reflective diamond shimmer that reflects any color near it. We were inspired by the 4 C's-color, cut, clarity and carat weight and have designed the perfect diamond gloss in a wand. Wear alone or over your favorite lipstick for a splash of "sparkling diamonds".